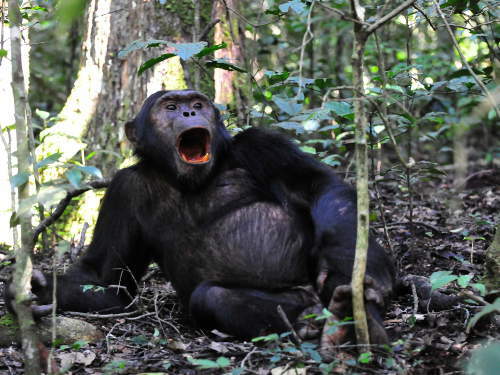 Let me tell you a little secret: All these programs are the same, as they are not organized by tour operators but by the Uganda National Park Authority: "Uganda Gorilla Safari", "Gorilla trekking Uganda", "Best Budget Uganda Gorilla Tour", "Gorilla Safari Uganda". There are only two places in the world where you can see mountain gorillas, Bwindi Impenetrable Forest National Park being the only place in Uganda, Rwanda being the other. 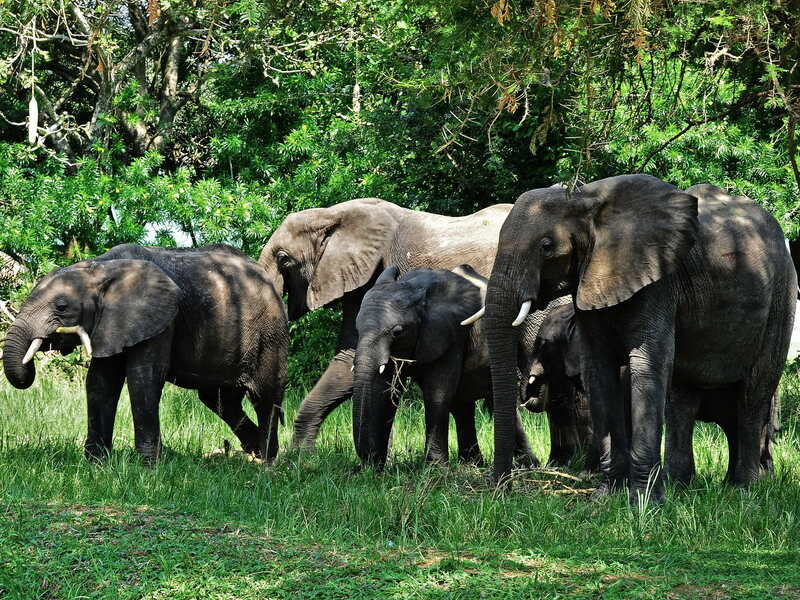 As a national parks expert, I organize Uganda Gorilla safari tours at a budget price, because I want you to get this once in a lifetime opportunity to see these gentle giants of the forest. As a lifetime conservation biologists, I plan the best national parks safaris in Uganda, which take you to a very representative sample of almost all ecosystems and all wildlife and birding areas in Uganda. Contact Us (++)(1) 304 - 581 – 7740 or . 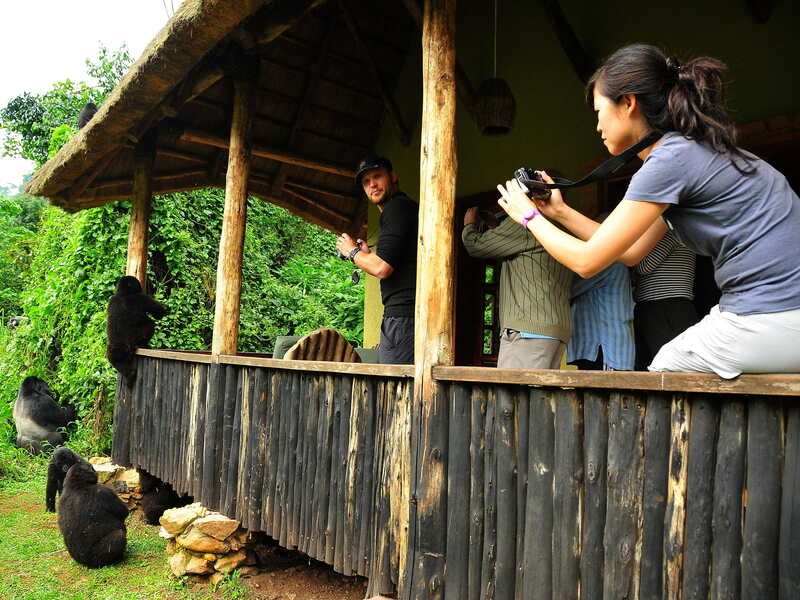 We are one of the few reliable agencies with accurate 2018 | 2019 gorilla permit booking information for tourists interested in trekking the mountain gorillas in Uganda. A gorilla permit is the official card that permits you to see gorillas in Uganda or Rwanda. 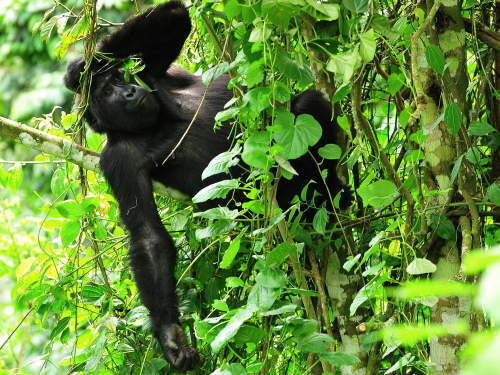 In Uganda, it is Uganda The Uganda Wildlife Conservation Authority is in charge of all the national parks and it issues a limited number of gorilla trekking permits for Bwindi Impenetrable National Park and Mgahinga National Parks. The 2018 | 2019 permits in Uganda for 2018 and 2019 are currently $600. 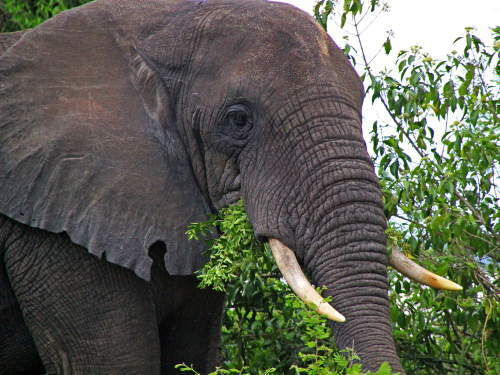 However, the Wildlife Authority and the Rwanda Development board aim at raising the prices of the permits. 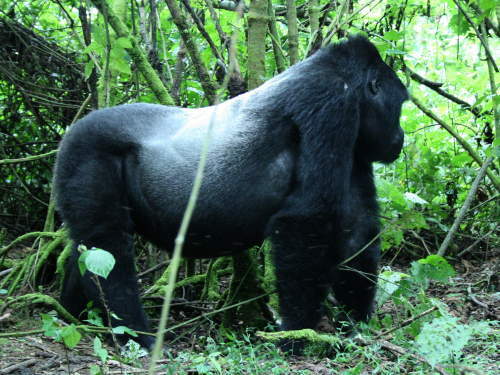 Currently, permits for trekking mountain gorillas’ in Rwanda cost $1500.00, while in Uganda, the permits are at $600.00. Because of the price difference between the permits in the two countries, most of the tourists go to Uganda, but we have been informed that the Uganda price may go up. We will keep you posted on developments. In the meantime, combining your Mountain Gorilla trekking adventure with the visit of a representation of the best national parks and other wildlife of Uganda is a once in a lifetime opportunity. Our National Parks safari tour is the best on the market! As the Mountain Gorillas are so critically endangered, the Wildlife Authority only allows a limited number of visitors per day, and the daily quotas are usually filled several months in advance. So it is highly recommendable to book your permit as early as possible, to avoid disappointments. Bordering Virunga National Park across the border with Democratic Republic of the Congo, is the UNESCO-World Heritage Site renowned for Gorilla trekking. 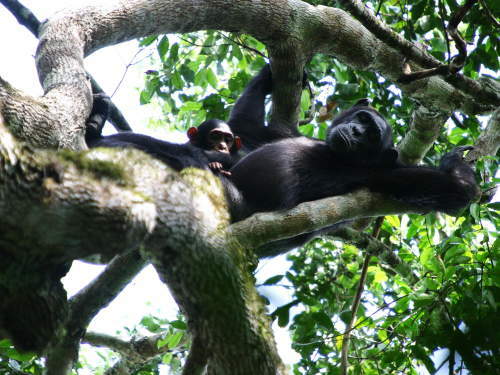 Here you will find how to get to Bwindi Impenetrable Forest National Park. 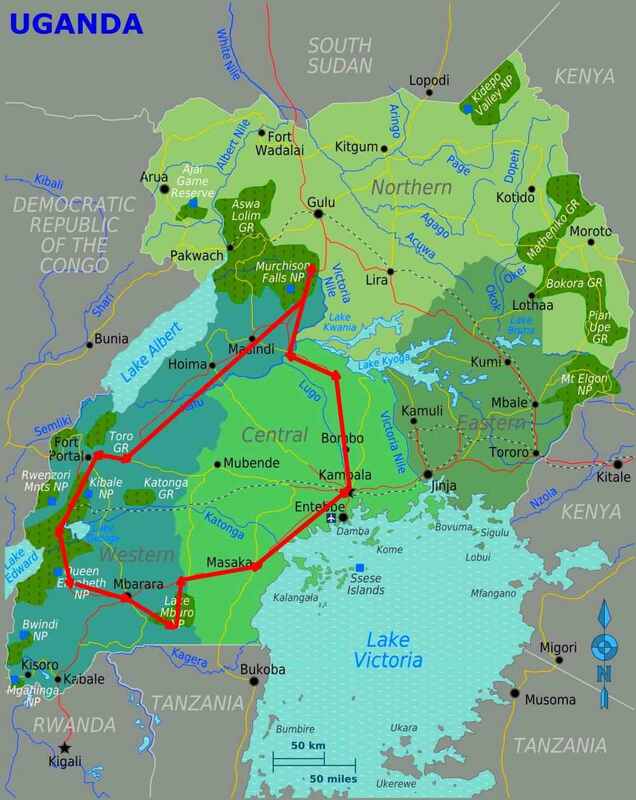 Situated on the Albertine Rift in the Western Rift Valley of southwestern Uganda, the 33.100 ha national park is part of the Bwindi Impenetrable Forest, containing both montane and lowland forest and is accessible only on foot. The highest parts are the Kigezi Highlands, vary rugged mountains, with narrow valleys and steep slopes. The elevations in the park vary from 1,190m in the north to 2,607m in the mountains in the south, while 60% of the park is above 2,000m, with Mount Rwamunyonyi, the highest peak. 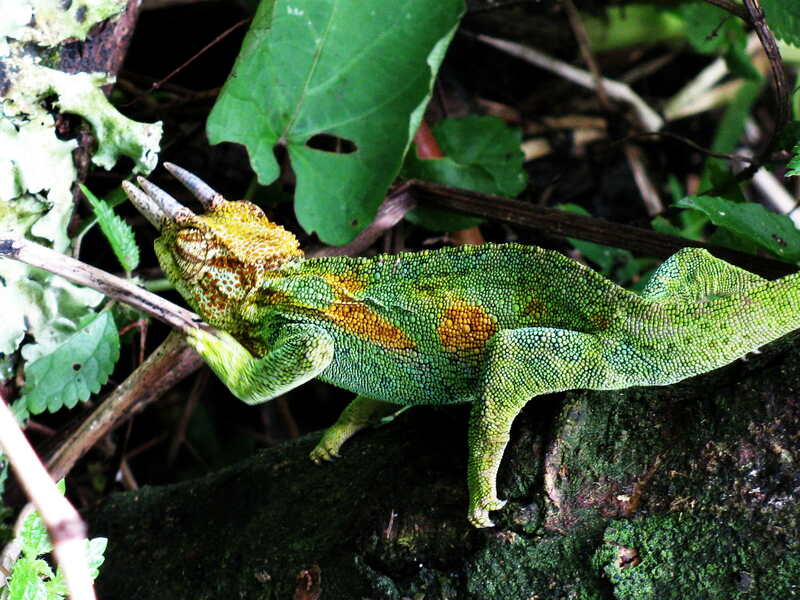 Due to its variety in elevations, as well as its higher rainfall, the park is extremely rich in wildlife and includes endangered and endemic species; our lists include about 120 species of mammals, 350 species of birds, 220 species of butterflies, 27 species of frogs, chameleons, geckos, etc. 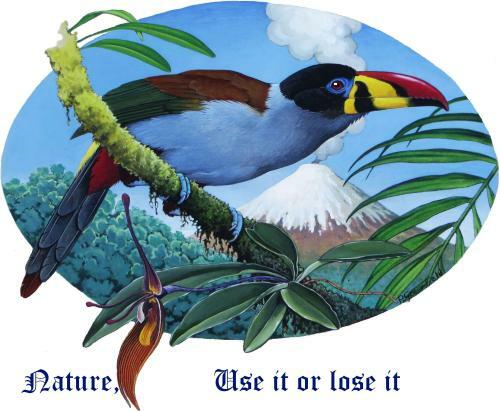 many endangered species call Bwindi Impenetrable National Park home. With 1,000+ species of flowering plants 165 species of trees and 104 species of ferns, Bwindi is amongst the most biodiverse forests in East Africa. While the northern lowlands of Uganda are more savannah like, the montane Albertine Rift is distinguished by its abundance of endemic species. 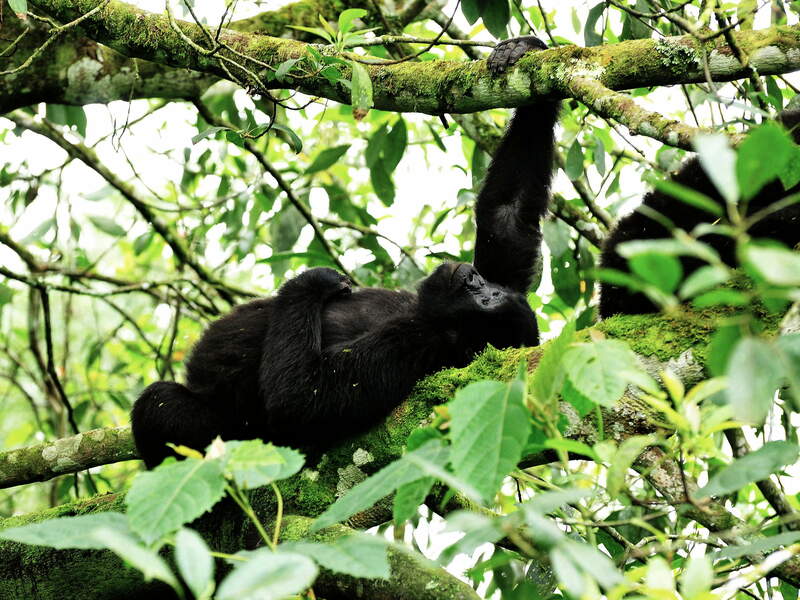 The park is most famous for its 340 Mountain Gorillas, half the world's population, which can be observed under the guidance and supervision of park rangers, after obtaining a $600 per person gorilla tracking fee. The other half lives across the Border in Virunga National Park. In fact, Gorilla Trekking, in Bwindi Impenetrable Forest National Park is much safer. The most common threats to the Gorillas are disease, habitat loss and occasionally poaching. There also is an interesting Chimpanzee population, as well as several Elephant herds. Mountain Gorilla in a tree. Mountain Gorillas in the camp. 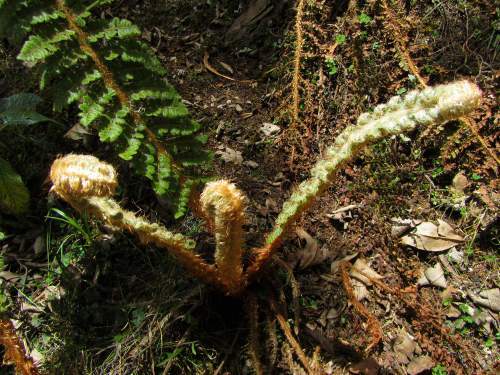 Incredible plant diversity; fern in the jungle. There is no doubt that Gorillas trekking in Bwindi Impenetrable Forest National Park, will be one of the highlights of your life, but don't only have your eyes out for these kind giants, as this park has so many other species you will not find anywhere else. We love to help you with how to get to Bwindi Impenetrable Forest National Park.